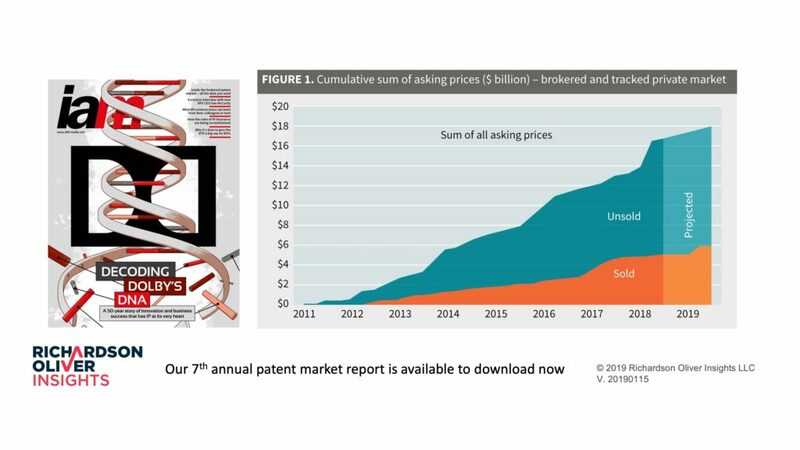 Since we started tracking the secondary patent market in 2011, we have identified more than $5.3 billion worth of sold patent assets and seen more than $16.7 billion worth of patent assets offered to the market. That’s a lot of deals being brought to the market on a regular basis and many of the opportunities come from brokers. The excerpt below is from our 2018 market paper published by IAM. Figure 1 is a snapshot of the market we have tracked for the past seven years. We have included both private and public packages and have estimated an overall total dollar value for the patent market. Our visibility into private packages is limited to packages on which we have worked. That said, the dollar value of the market is surprisingly large and diverse. Figure 1 also shows an extrapolation of the market through to the third quarter of 2019. Between about $1.5 billion and $3.75 billion in new potential packages enter the market every year. The sales data as of the third quarter of 2018 includes only sales for which we have identified an assignment document. Projecting through 2019, we expect cumulative total sales to reach over $6 billion. (Originally published in IAM Magazine January/February issue 2019). Read our latest patent market report on IAM Media here (login required).